Puddles in Your Yard: A leak might cause some unexpected wet spots in your lawn. The Grass Is a Little Too Green: The sewage leaking from your line may be gross to you but it’s great to your plants—they use it as fertilizer. If you notice that your landscaping looks especially great out of nowhere don’t chalk it up to your green thumb, make sure you’re not having trouble with your sewer line! Cracking Concrete: Not an odd amount of cracking? It might be due to the fact that your sewer line creates pressure that damages the foundation of your home. Sound of Running Water: Are you constantly hearing the sound of running water, but you can’t find the source? 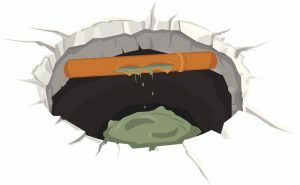 A leak in your sewer line could be the source. You can have your sewer cleaned! We have impeccable sewer cleaning services here at Pipeworks Inc. If you’ve noticed that you’re having trouble with backed up drains or toilets in your home, then you need sewer cleaning. It will greatly benefit your system. Our professionals will come out, determine if your sewer line needs cleaning, find any blockages or obstacles (backups, intrusive tree roots, debris), and then take the necessary steps to clean out your system. These “necessary steps” might include either cleaning with the aid of an auger or hydro jetting. Generally, we try to use hydro jetting because it’s extremely thorough and less invasive than work with an auger. If you need great sewer cleaning services here in Bloomington, contact Pipeworks Inc. for professional service at great prices.